Have specific questions about how the use of CHAT could benefit your church? Why should we conduct a church assessment? When is an ideal time for a church assessment? What will I get out of using the Church Health Assessment Tool? How was the Church Health Assessment Tool (CHAT) created? Can we add questions of our own to the survey? How much does the Church Health Assessment Tool (CHAT) cost? Is it the same price for large churches and small ones? How long does it take for the average person to complete the survey? Is there a paper version of the survey for those without a computer? What is the best way to communicate the instructions for participation to the church body? What will we receive at the end of the process? Is there a section of the report that displays demographic information? How long does the whole process take from the time my church signs up until we get our report? How do I sign my church up for CHAT? What if we would like additional assistance after the CHAT process? How often should my church participate in a church health assessment? Why should we conduct a church assessment ? For the same reason you look both ways before you cross the street … to evaluate where you are, where you are headed, identify any danger, and make wise decisions going forward. Having a solid baseline of accurate and objective information from your entire church (rather than anecdotal conversations or gut feelings) dramatically increases your ability to plan, strategize, and lead the ministry God has called you to. You may also discover an increase in the unity of your church body as a direct byproduct of the leadership clearly saying, "Our church is made up of many people and each voice is important. We're conducting a church-wide 'listening exercise' and we value your thoughts." Clarity. As a leader you know that decisions are more easily made in a context of clarity. The difficulty in decision making comes when we rely on a gut feeling or anecdotal feedback rather than a fully informed perspective. CHAT will cut through the fog and give you clear direction. Objectivity. Critics often have the loudest voices. CHAT levels the playing field and gives you sound affirmation of the areas where your ministry is excelling and clear insight into where your attention is needed the most. CHAT’s third-party objectivity prevents any particular bias from influencing the results. Measurability. Progress can be difficult to gauge without some quantifiable categories that you can compare from year to year. CHAT will provide that framework for you through helpful charts, graphs, and specific feedback. Unity. As an added benefit, engaging in this process communicates that you value your people. Members of the church family will appreciate knowing that their feedback is important and necessary in order for the church to grow in healthy, life-transforming ways. The assessment is based on extensive research with over 2,000 churches and individuals. 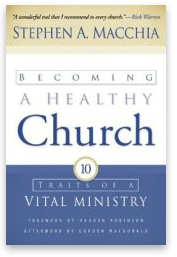 This research study culminated in the "10 traits of vital ministry" which are outlined in the book Becoming a Healthy Church (by Stephen A. Macchia, Baker Books, 2006). The 72-question survey unpacks each of the 10 traits of a Healthy Church by looking at each trait from several different angles. Click here to preview sample questions. Yes you can. After signing up, you'll have the option to upgrade to the custom questions module for $49 which will give you the option to add up to ten questions (multiple choice or 1-5 scale) plus a bonus question (open-ended). These questions will be added at the end of the CHAT survey for each participant (online version only) and the results will display at the end of the Executive Summary of your CHAT report. $399 - which includes the use of CHAT for unlimited online and paper surveys, access to the Pastor's Console, and your CHAT report (including any demographic sub-reports). Click here to view the pricing page. Activating the custom questions module is an additional $49. Yes, $399 includes the use of CHAT for unlimited online and paper surveys, access to the Pastor's Console, and your CHAT report (including any demographic sub-reports). Click here to view the pricing page. Activating the custom questions module is an additional $49. It takes the average person 20-25 minutes to participate in the survey. Yes. Via the Pastor's Console, you can print paper copies of the survey for those who don't have Internet access or are not computer savvy. Once the completed paper survey has been filled out, it can be manually entered into the system by a church staff member (again, via the Pastor's Console). Another option is to place a computer with Internet access in a common area of the church for public use while the survey is open for participation. Via the Pastor's Console, you can print bulletin inserts that contain all the information for participation. These inserts are in MS Word format and can be customized for your church (these areas are marked in red text). You can customize and print these instructions to be distributed at your worship service. You can also copy and paste the instructions into an e-blast to your members (if you have this capability, we recommend doing this in addition to handing out the paper instructions). You'll receive a comprehensive report containing four sections: Executive Summary, Detailed Survey Findings, Additional Comments, and Suggested Next Steps. All responses are kept strictly anonymous. The report is full color and easy to read. Click Here to view a sample report. Yes. The first piece of the assessment collects the following demographic information: Leadership/Congregation, Gender, Marital Status, Age, Years at our Church, Ethnicity, and Education. These demographics are kept anonymous and displayed in pie chart form in the first section of the end report. If you choose to activate the Custom Questions Module, you can add an additional 2 demographics questions. You choose how long you want the survey to be available. In the process of registering your church for CHAT (which takes less than 5 minutes), you'll select the date that your survey opens and the date that it closes. Then you just need to get the word out to your congregation and encourage as much participation as possible before the survey close date. On average, most churches will make the survey available for about four weeks so that they have the opportunity to plug it during several services. When your survey close date comes, your CHAT report will be generated over night and you'll receive an email the following morning with a link to your CHAT report. The sign up process takes only 5 minutes. First, you'll fill out a quick registration form including some information about your church, contact information, etc. Second, you'll choose the dates you'd like the survey to be available for participants and customize the greeting that each person will see as they log in to participate in the survey. Third, you'll choose one password for the leadership team and another for the congregation (we're going to track their responses separately for direct comparison in the report). Finally, you'll use a VISA or MasterCard to pay $399 (plus, optional $49 custom questions upgrade). To sign up now, Click Here. If you feel like you might need some extra help after going through CHAT, you have the option to enlist the help of one of our Church Health Coaches via a Teleconference Package. There are several packages to choose from - each kept affordable by conducting the coaching by phone, rather than putting the coach on an airplane. Click on the link above to read through each of the follow up sessions that will serve as a basic road map in your telecom meetings together. Every church is different so your coach will advise you based on your specific church's gifts, challenges, opportunities, etc. We recommend taking the assessment once every 12-18 months. Remember, this is not just an exercise, it's an opportunity to listen to one another - and we recommend making a habit of it. Call toll-free 877-832-6584 and ask for Rick Anderson.